The calendar says it’s summer, but my weatherman (aka George) observes: Brrrrr … . Happily, despite our fog and chilly temps, the Anise Swallowtail butterflies are here on schedule. I haven’t seen any adults visit the garden, but they’re leaving precious yellow eggs on the fennel. The egg on top was probably laid today, the one with darkening bands was likely laid several days ago. 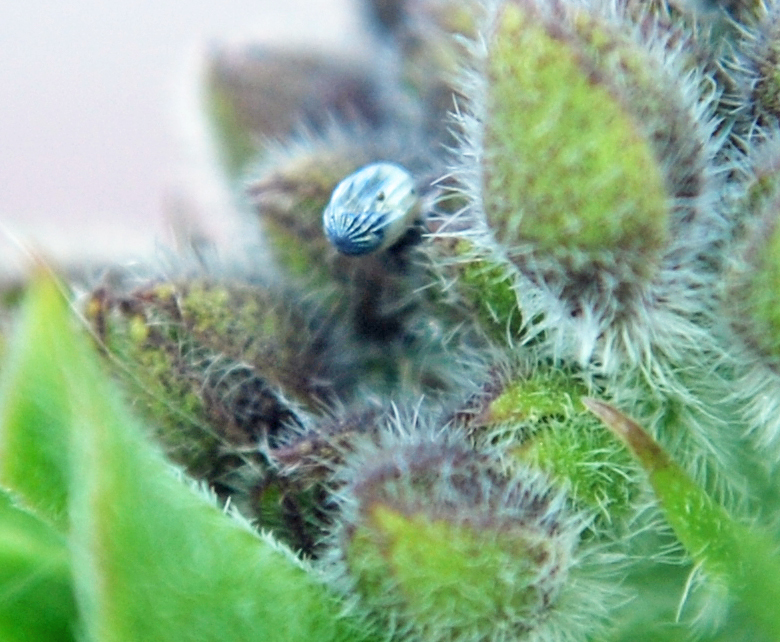 This is an extreme closeup shot – the eggs are smaller than the head of a pin. I took this photo in 2013 of a female laying an egg (ovipositing) on the same fennel plant. We keep the eggs and caterpillars inside in a net cage where we feed them and keep the chrysalises safe until the adult butterflies emerge. We also rescued several caterpillars from a plant in our neighborhood that has been cut down in previous years. This guy just shed his skin (on the right). 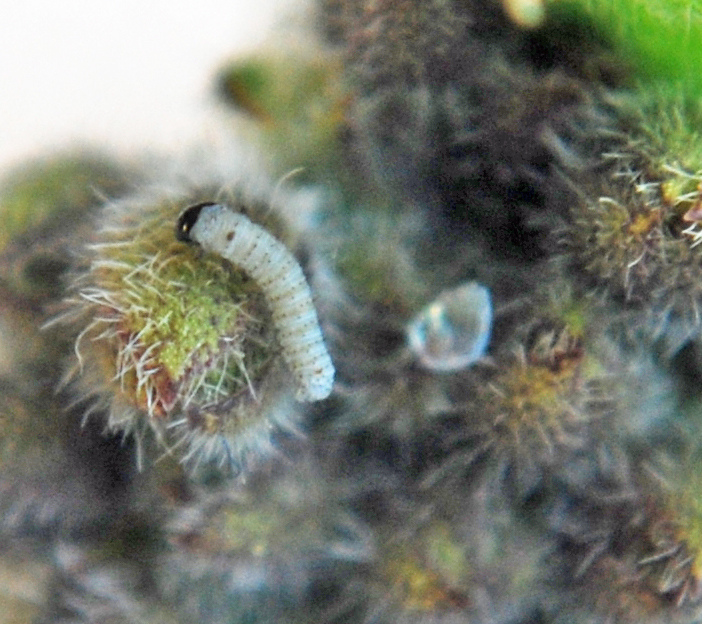 See how coloration varies in different larval stages. So far one adult has emerged. When the sun finally came out I put her onto a lily plant on the deck, and after a minute or so she happily flew away. Want to see more of these wonderful butterflies and their life cycle? My 2013 post about anise swallowtail butterflies. And from 2012. Another from 2012. And another! And from 2011. Another from 2011. And another! What do feral cats and butterfly caterpillars have in common? Not much beyond linguistically – some people use the affectionate term “cat” to mean caterpillar. Other than that it gives me an opportunity to tell you about my weekend. I was helping George feed one of his feral cat colonies in an overgrown field when I saw an anise swallowtail butterfly on a mallow plant. The helping part ground to a halt while I took photos, but George didn’t complain. I had brought the camera to get some photos of the cats. They know him and come around when he brings their food and water. Some hold back until he steps away. Others are so friendly it’s obvious they were house-cats, mostly likely abandoned when people lost their homes. Shameful, even so. 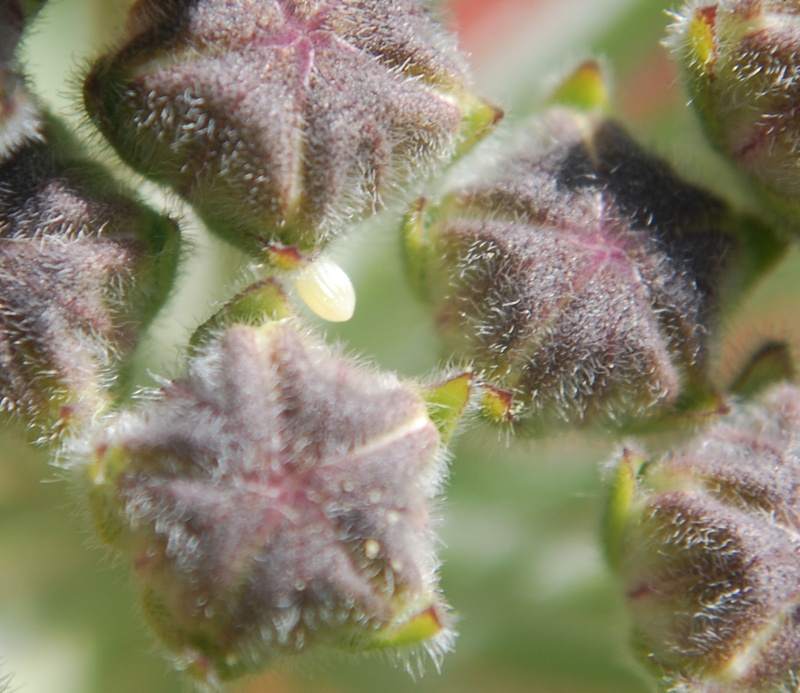 After we fed the cats I found one swallowtail butterfly egg on a wild fennel plant. This time of year there should be many more. I hadn’t found any eggs on our garden fennel yet, but I was curious after finding the one in the field, so I checked – no eggs, but one large caterpillar! We’ll let it make its chrysalis in our butterfly nursery, and then release it after emerging. I’ll keep you posted! Just a reminder if you have wild fennel growing on your property – yes, I know it gets rangy and out-of-control, but if you need to cut it down before it dries out, please check for eggs, caterpillars, and chrysalises. Making your yard look neat could cost the lives of many of these beautiful butterflies. So my wish: more caterpillars, no more abandoned cats! This past year I selected my best photos of monarch butterflies from egg to emerged adult, to create a poster illustrating the monarch’s life cycle. In all my time photographing monarchs I never imagined I’d be able to capture one depositing an egg on milkweed; their visits to the garden are sadly rare, and the female leaves her eggs quickly and flits away. But disciplining myself to bring my camera whenever I went into the garden finally paid off. One day this summer I saw a female ovipositing, and quickly grabbed some photos before she flew off. The cycle was finally complete, I thought, but of course I forgot one crucial part: mating! Yesterday George and I took a road trip to a local overwintering spot for monarchs, and were joyously watching several large clusters in the eucalyptus trees. Many lone butterflies were also flying around. Noticing one fluttering its wings in the grass, I went to see whether it was stuck and needed help. I called George over, and with his keen naturalist eyes he spotted what I had missed; there were two. Here the male fluttered his wings over the female. Since it was almost evening, they probably stayed on the ground overnight because monarchs can’t fly if their body temperature goes below about 55 F (13 C). And now the cycle truly is complete! Has Mother Nature thrilled you lately? If so, let us know! We’re still finding anise swallowtail butterfly eggs on the fennel in our garden. And ta .. daaa… the first of the recent batch we’re raising emerged today. Born on the Fourth of July; more orange, yellow and blue than red, white and blue, and with stripes! The caterpillar at the top of the enclosure looks like it’s ready to form its chrysalis. And here are younger sibling caterpillars, still eating away. We’ve been gathering fennel around the neighborhood, because our plants are starting to be pretty sparse after feeding at least 30 growing caterpillars! So which do you think came first, the butterfly or the egg? I don’t have an answer to that old conundrum, but to bring the story full cycle, I just took this photo of one of the anise swallowtails depositing eggs on the fennel in our garden. 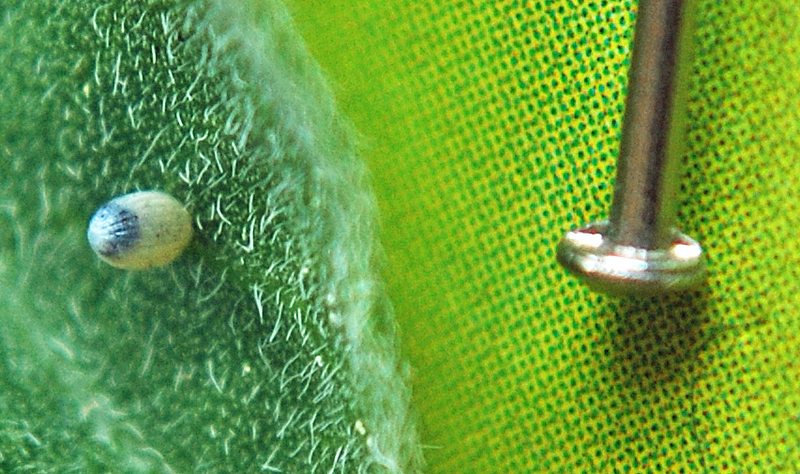 Since we’re also finding monarch butterfly eggs on our milkweed, I took an extreme closeup photo of a monarch butterfly egg (on the left) and an anise swallowtail egg (on the right), to compare their sizes, and with the head of a needle included for scale. 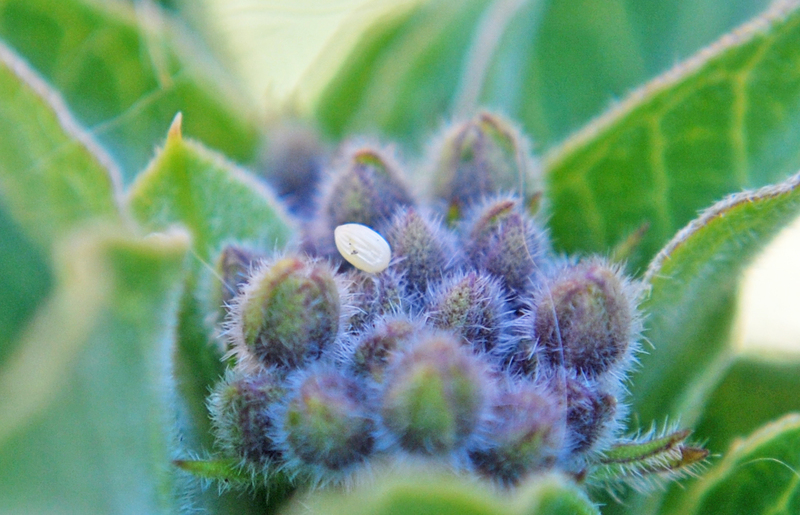 Click here to see my post about the monarch butterfly that left that egg. I’ve said it before, and I’ll say it again – if you have to cut down the fennel that’s growing on your property, please check it carefully for eggs, caterpillars, and chrysalises first. You could be killing an entire generation of anise swallowtail butterflies. Why do you get up in the morning? For me, it doesn’t get any better than this: I was outside in the garden yesterday to check on a squawking hen. Looking up as a shadow crossed over my head, I spotted a monarch butterfly. A very welcome sight, because this hasn’t been a good year for monarchs; she was the first one I’ve seen in our garden all year. She flitted around several of the milkweed plants that George has planted to attract the monarchs. 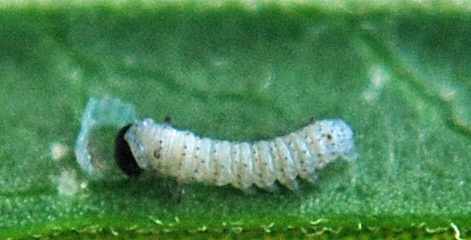 Milkweed is the only plant that monarch caterpillars eat. Finally, she found one to her liking and deposited an egg under a leaf. If I hadn’t taken this photograph of her leaving the egg, I don’t think we would have found it, it was so well hidden. We carefully inspected the other milkweed plants and found several more eggs. I wonder how many we missed! The one high up in this milkweed plant (it’s the yellow dot near the center of the photo) must have been left a few days ago, because it already hatched, as did a second one George found on the same plant. 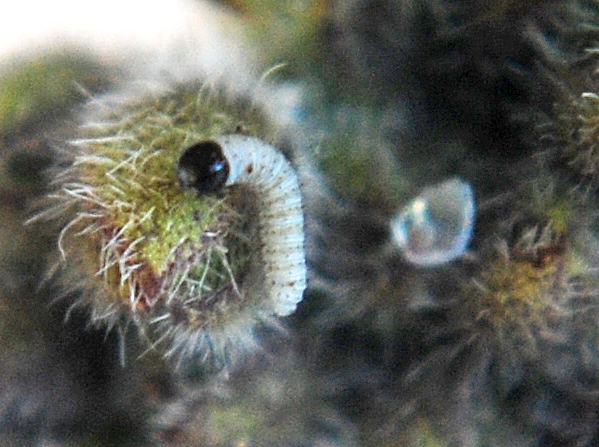 This photo with the head of a pin included shows the size of the egg and the two tiny caterpillars. Have you seen any monarchs in your garden? Are you planting milkweed to attract the females and feed the caterpillars? 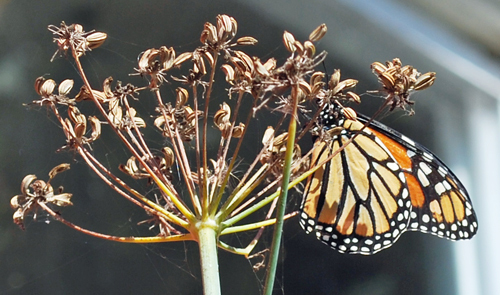 Did you see my post about the monarch butterfly in our garden? 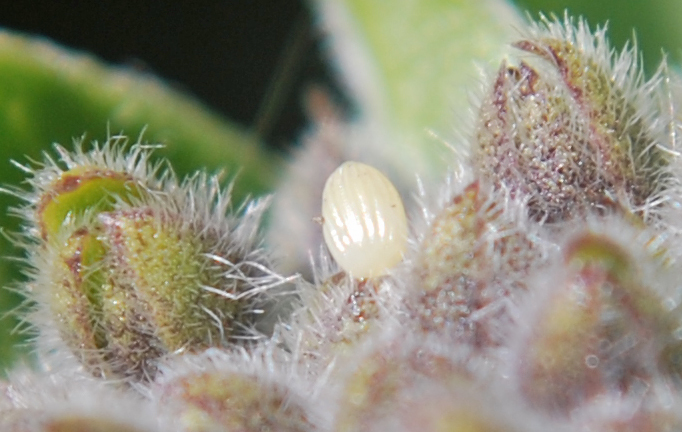 And my follow-up post about the eggs that she left on our milkweed? 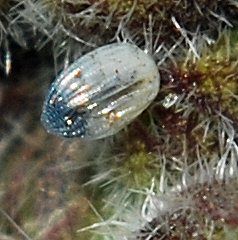 And here’s one of my closeups of one of the eggs we found – for scale, remember that they’re about the size of the head of a pin! We decided to raise them inside, because it greatly increases their survival rate. We found 13 eggs, and carefully brought them inside on Thursday. 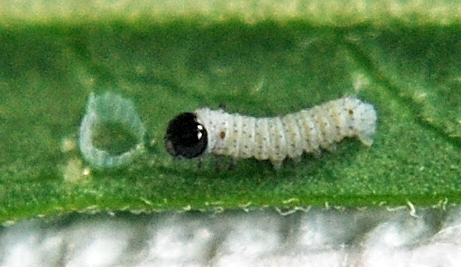 By Saturday some of the eggs had lost their yellowish color, now appearing grayish-white with darker shading inside (the caterpillar’s skin has formed and is showing through the egg, which is actually translucent). You can see its egg to the right. The tiny caterpillar is exploring and eating the milkweed. I just checked, and more of the caterpillars are emerging, so check back for more photos! In fact, here’s a new photo of our second baby. 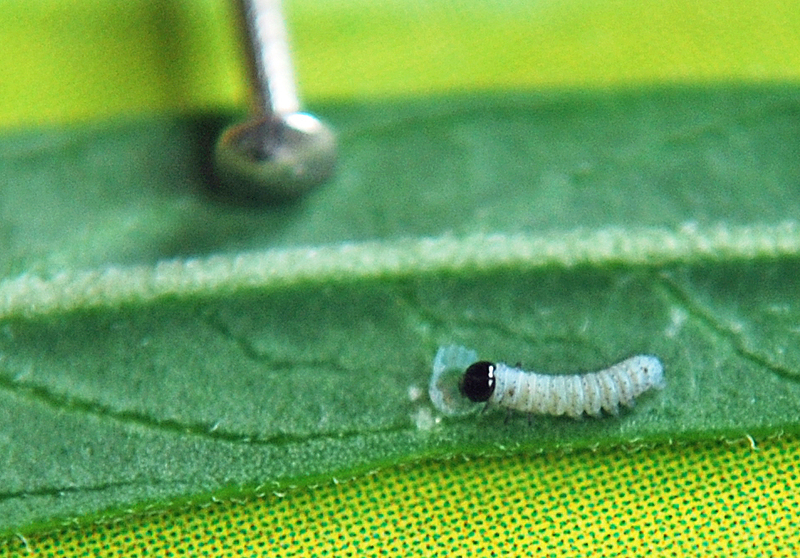 This caterpillar emerged from the only egg of the batch that we found on another type of milkweed, the Asclepias physocarpa. He’s headed back to eat more of his eggshell. 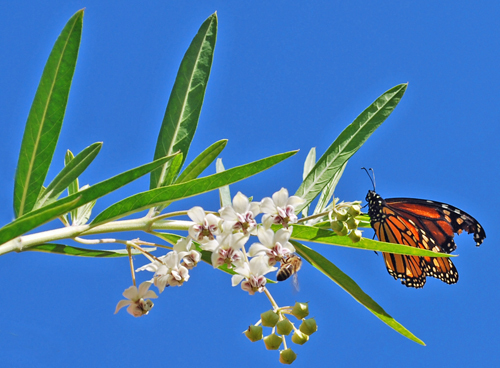 Click here to see my photos of the entire life cycle of the monarch butterfly, which I took in 2009, the last time we found eggs on the milkweed in our garden. Monarch eggs in the garden! Well, guess what? George was right that she was a female – she left us some precious gifts. 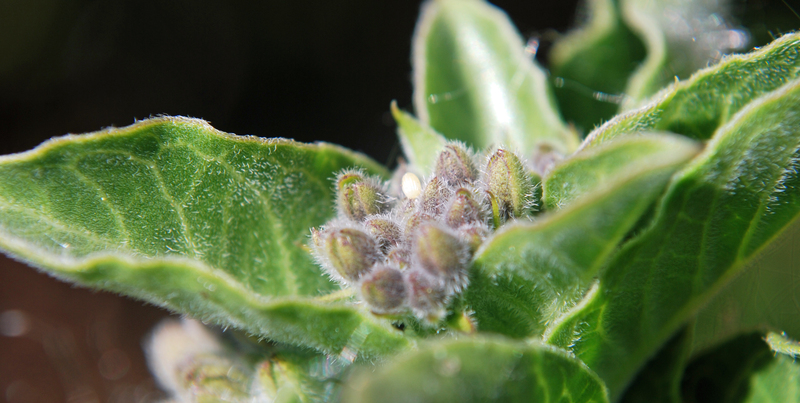 Yesterday I noticed many tiny yellow eggs sprinkled on our milkweed plants. 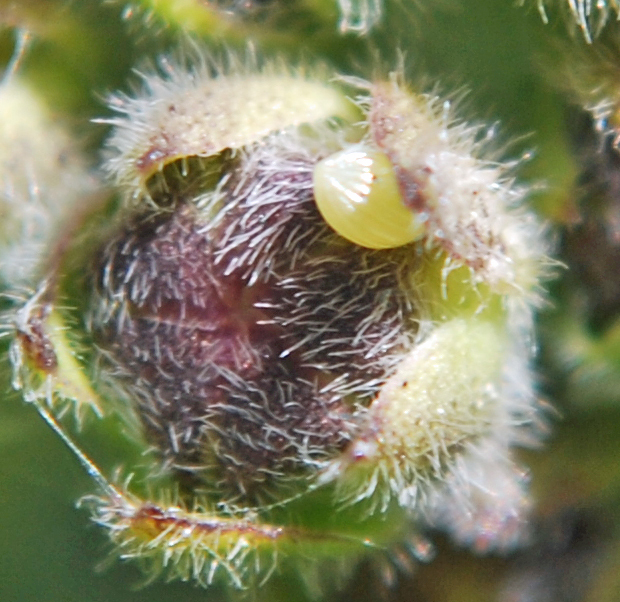 Here’s an extreme closeup of one, it’s about the size of the head of a pin! Finally, I really hate to post an out-of-focus photograph, but I took this one last night when we first found them, and the light was fading and I had no time to set up my tripod (excuses, excuses), so sorry for the fuzziness, but it shows you the size of the egg in scale with George’s finger. I mentioned in my prior blog post that we have hardly seen any monarchs in our garden for a couple of years. 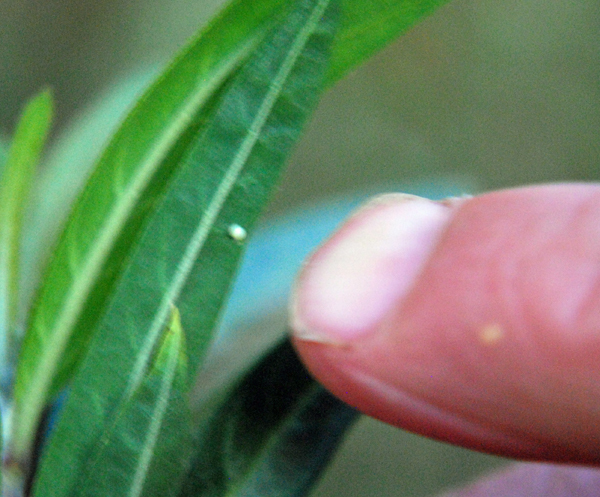 I checked, and it was Spring 2009 when we last had the good luck to find monarch eggs on our milkweed. We raised and released them, and I photographed the entire process. You can see those photos by clicking here. The mortality rate of butterflies left outside is quite high, due to predators, weather factors and other causes, so raising them indoors greatly increases the chance that they will survive. We’re honored that this monarch trusted us with her eggs, and we will guard and nurture them until they emerge, then let them go to continue the cycle!